The Karaites, or Ba’alei Mikra (People of the Scrip- tures), follow strictly the Written Law of the Hebrew Bible. While the Bible has shaped how they perform the commandments and conduct their religious life, constant contacts with Rabbinite Judaism influ- enced their traditions. One primary example is the use of a ketubbah. 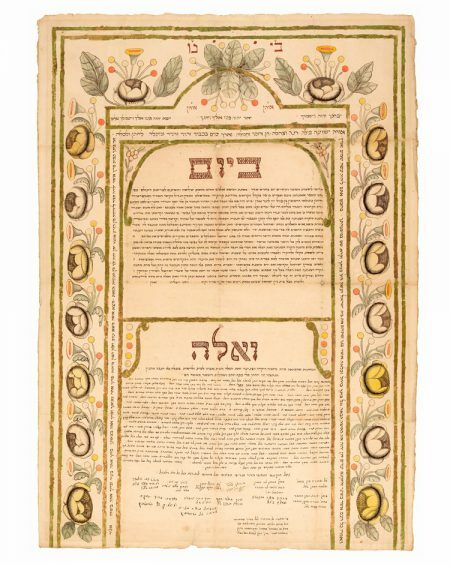 Although it is a rabbinical institution, the marriage contract has been an essential component of the Karaite wedding ceremony from the early Middle Ages to this day. The Karaite ketubbah, unlike the traditional Rabbin- ite contract, is written entirely in Hebrew. Also, it invariably comprises two parts: a) shetar nissu’in (marriage deed), a declaration of the bridegroom’s intent to marry the bride, the obligations of the marriage bond, the bride’s acceptance, and their mutual commitment to the Karaite calendar “as stipulated on Mount Sinai,” and, b) shetar ketubbah (ketubbah deed), the financial obligations of the groom, and a detailed list of the bride’s dowry (based on the mohar or bride’s price, as deduced from Exodus 22:15–16). The former section occupies the upper part of the page, and the latter, the bottom. Karaite ketubbah decoration followed the norms of the Rabbinite traditions where they lived. Eschewing figural representations, the main designs comprised floral and geometric motifs. The Karaite wedding recorded here was celebrated in the important community of Qirq-Yer in the Crimean peninsula (West Ukraine), known also by its Turkish name Chufut-Kalé (Jewish Fortress), under the government of our great master, the mighty Emperor Nicolai the first (Czar Nicholas I, 1796–1855), son of Pavel, May he live forever. Amen.” The two sections of the text are set within frames, painted with gold, and surrounded by flowers. In the tradition of many Sephardic, Italian, and Eastern ketubbot, initial words are decorated and appropri- ate biblical passages, such as that of the marriage between Ruth and Boaz at the city gate (Ruth 4:11–12), are included in the inner frame. The dowry list is longer than the text in the first section; in accordance with Karaite custom, many respected witnesses (here 12) were invited to sign the contract. Dowry: Selected items: gold ring valued at 16 rubles; earrings at 24 rubles; gold bracelets at 30 rubles; necklace with pearls and rubies at 125 rubles, etc. In addition, the bride’s father gave her with a 1000-plant vineyard located in a nearby village.